Which kit are you using for that build? Sorry Kit, not ignoring you. For the XFV-1 i'm using the Valom 1/72 kit. Well some of it anyway. Fit is problematical but nothing that can't be adjusted. Intake trunking and an improved exhaust liner have to be scratched up to prevent the dreaded see through syndrome. There are no locating pins, slots, tabs or holes which makes fitting the wings. tail and cockpit interesting. As I am using different wings I drilled and pinned them with chunks of paperclip. The tails are too thin for this and i've already broken one off once. I expect to do so again before i'm finished. I thought carefully about the conttraprop and modified it and built jigs in an attempt to ensure it rotated concentrically. I failed so it'll be glued solid. Today though I mainly worked on the TurboStuka. I built a twin tail using Heyford rudders. I'll come up with some words to explain the fabric covered parts. Perhaps it is done to reduce the Stuka's tail heaviness? Thanks Fred, I have that Valom kit too, but I'm using it for 'something else'. I agree about it's fragility, it's almost as if they built it as lightweight as the real thing! However, it's better than the two alternatives, the Pegasus one being built like a battleship but well worth having as it's the only kit in the world with my name on the box. The second alternate is the awful Airmodel vacform/resin kit, I've tried to build that one twice, and failed spectacularly! Looking forward to seeing some more photo updates. The Turbo Stuka is a great idea. I found a half-built Pogo when I was cleaning out the stash room yesterday. Not sure which kit tho.....was going to be a Vietnam era bird. Looking forward to seeing the turbo Stuka. 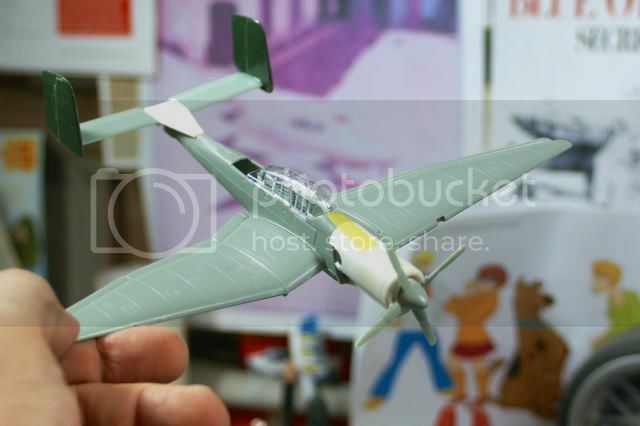 TurboStuka (sans engine - I need to carve some panel lines on the cowling and fair it in properly). I may trim the wingtips a touch to make them more rounded. 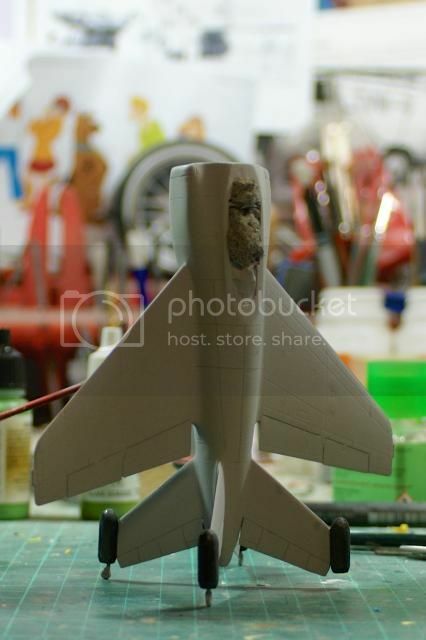 I'm still not sure if this will be an interceptor or a strike aircraft. Those aren't belly fins, they're the wings of the thing, sticking out sideways. The bits pointing down? Guess i was looking at it with the Viper in mind... Still looks like it would be agile... Anyway, it's looking good! 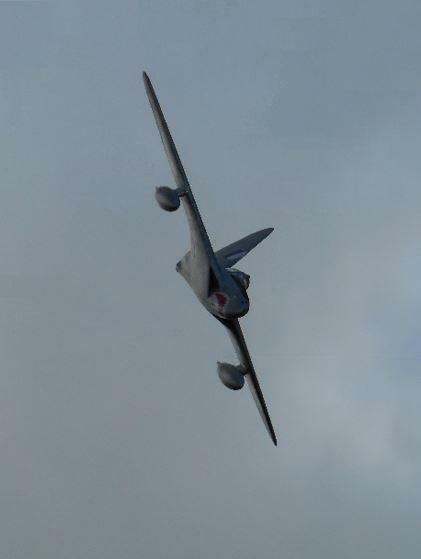 They're the tail fins/undercarriage legs. See below for the real world version. Nice. I had the wrong idea when I said Pogo. Damn Ys and Xs The Stuka is looking really cool. Ok, so that's the type... I get it now. I did find them a bit too big for ventral fins but thought they could be the folding type or something. Blame my deliberately misleading photo. Here's a better one. A touch of PSR on the wheel pods and it'll be paint time. 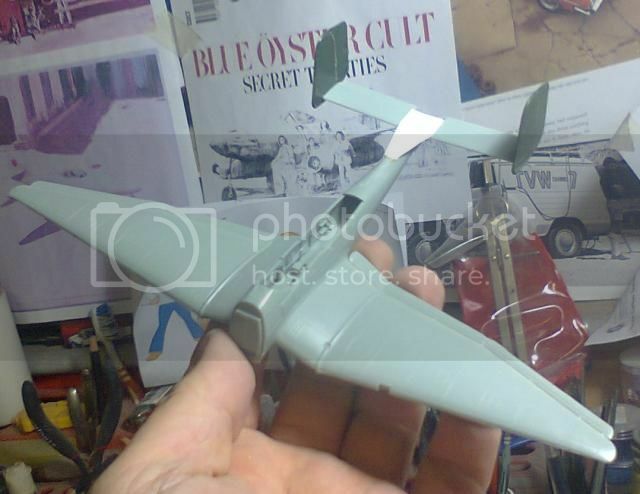 And here's the TurboStuka with more bits taped and blu tacked in place.